Here at Nydree, we’re gearing up for this year’s Hospitality Design Expo in Las Vegas. The location couldn’t be more exciting for the breadth of industry professionals expected in attendance at the event. Not only are we looking forward to spending time at the Mandalay Bay venue, we also can’t wait to check out some other high-design spots in Las Vegas. To get ready for this year's HD Expo in Las Vegas, we’ve pulled together a list of five of the most inspiring hospitality spaces in the city. If you plan on attending the convention, be sure to take some time to explore these one-of-a-kind spots. Open only a little more than a year, David Chang’s Las Vegas edition of Momofuku has made waves in both the dining and design arenas. 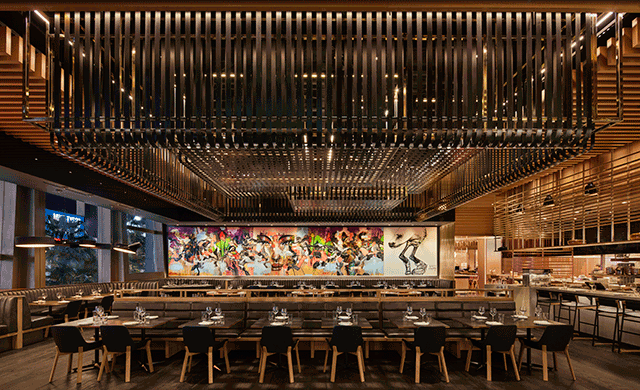 With great views of The Strip as well as excellently curated artwork that captures the essence of Las Vegas’s spirit, this New York-based restaurant is a fusion American, Japanese, and Korean cuisines. Sleek lines and subtle curves create an ultra-modern vibe, along with black accents and warm white oak tones. In addition to graffiti-style murals, Momofuku also incorporates several neon signs that make it feel like an authentic ramen bar from a world-class East Asian city. And while open kitchens may be more prevalent day by day, it’s anything but mundane at Momofuku Las Vegas. The Tea Lounge is a special place. 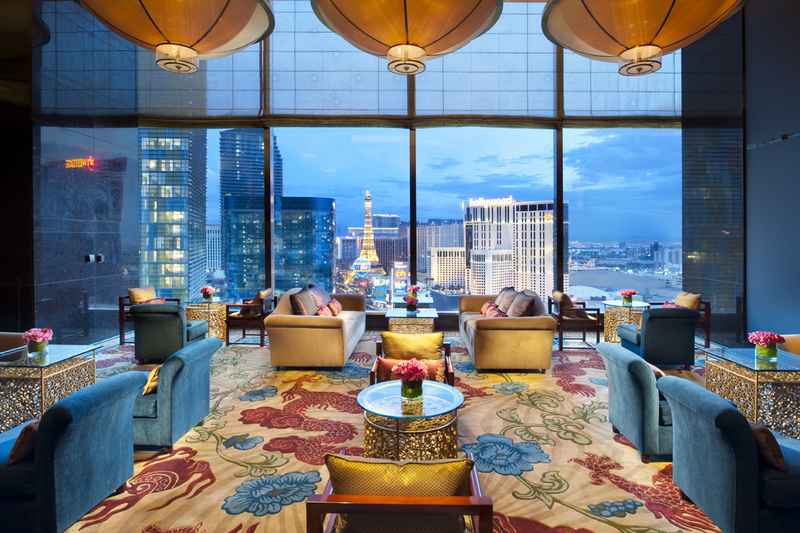 Beautifully framed with floor to ceiling windows, Las Vegas lies before you as almost the antithesis to the lounge itself. Soft, voluminous seating encourages self-reflection in one of the busiest places on earth. The overhead lighting is large and circular like a Japanese parasol, while rich jewel tones provide a depth throughout the space. Like yin and yang, the Tea Lounge at the Mandarin Oriental truly provides an experience of contrasts with both color and texture. It’s certainly not to be missed when you’re in Las Vegas. Everyone knows the often repeated Las Vegas saying, “What happens in Vegas stays in Vegas.” On one level it means people go to Vegas to get away, and perhaps there’s no better place to do just that than the Bardot Brasserie. 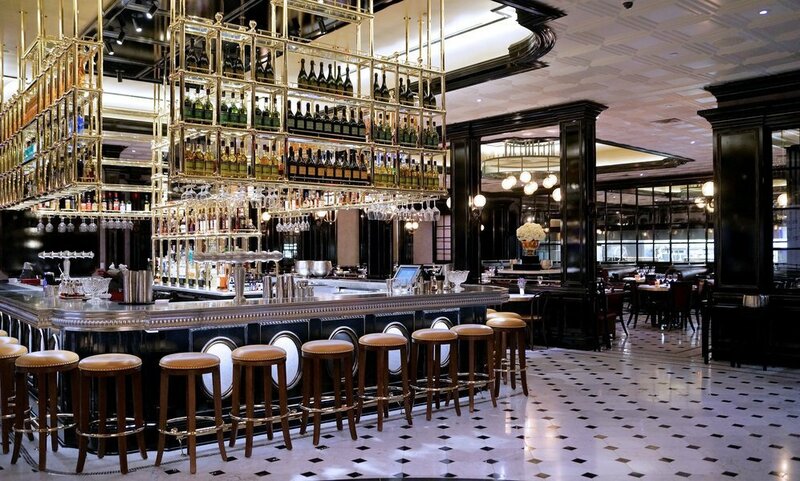 Modeled after 1920’s Parisian bars, the Bardot Brasserie is like walking back in time to the roaring twenties of pre-war France. The drinks and cocktails are derived from old French recipes and spirits, and the architecture and design don’t seem so much like throwbacks and referential as they do actually stolen from the past. The Bardot Brasserie is considered one of the best dining and bar experiences to be had in Vegas and for good reason. 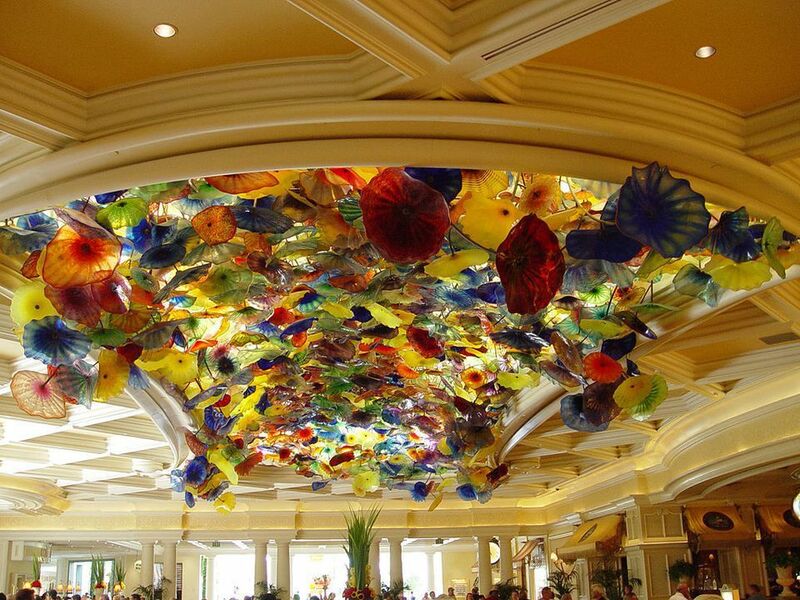 American artist Dale Chihuly has artwork all over the world, but in the heart of Las Vegas at the Bellagio Hotel is one of his more astonishing pieces, the Fiori di Como. Translated as “The flowers of Como,” this centerpiece weighs no less than 40,000 pounds and is a collection of 2,000 individually hand-blown glass sculptures representing Italian fields in the heart of spring. Apart from the epic architecture, most people think of the dancing water fountains when they think of the Bellagio Hotel, but those who have been inside know Dale Chihuly’s masterpiece steals the show. Panevino oozes Vegas in ways not many other places in Vegas are even able to come close to. It has beautiful views of the city framed by floor to ceiling steel frames that crisscross the panel windows. While the windows alone are an architectural feat, the restaurant’s design also makes the experience feel intimate and luxurious. Deep red textiles punctuate curved booths that make it easy to concentrate on your dinner guests. For extra talking points, there’s even beautiful blown glass lighting throughout the space, making Panevino a truly unique Vegas hotspot. See you at the HD Expo! Register for a FREE HD Expo Pass with our promo code EXIV151528. Click to HERE register now! And visit us at Booth #1551.